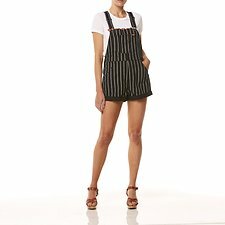 Our beloved short overalls are updated for the season in a super soft open weave vintage inspired black striped denim. They feature a relaxed silhouette through the body with a cheeky slanted hem to keep them playful! They feature our new silver hardware and red HPL label to add a modern vintage touch. Super versatile and comfortable.